PREPARING DECADENT DESSERTS AND EXQUISITE CAKES HAS NEVER BEEN SIMPLER, THANKS TO OUR RANGE OF INNOVATIVE HEART MOULDS BY ITALIAN SILICONE EQUIPMENT SPECIALIST SILIKOMART. The range is perfect for creating highly-detailed recipes with a romantic theme, perfect in the run-up to Valentine’s Day. Combining high-quality materials with the passion for artisan detail that Italian chefs are renowned for, Silikomart Moulds will be sure to add new levels of creativity within the kitchen, making them the perfect addition to your pastry counter. 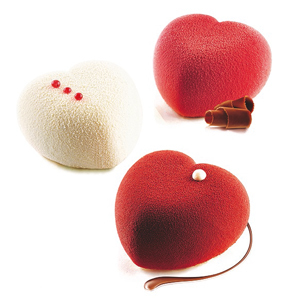 For specialist dessert menus or for Valentine’s Day specials, the Silikomart Heart moulds will help to create a real point of difference within your dessert offering. Fill these moulds with delicious Gelato made on site using a Nemox ice cream machine and the diner will not only be amazed by the look of the dessert but the taste as well. Silikomart Heart Moulds are just one of a wide variety of shaping tools now available to UK caterers from Mitchell & Cooper. From moulds to form smooth quenelles and perfectly spherical truffles, through to intricately-detailed mats for whole cakes, the range presents infinite possibilities for contemporary creative chefs.